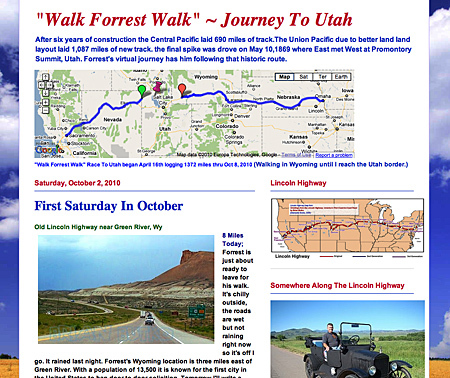 In honor of the Transcontinental Railroad, Forrest has been taking a virtual walk along its route (ala Forrest Gump), following the westward progress of the Union Pacific from Omaha to Utah. He began April 16 and has logged 1372 miles as of this morning. He writes about the towns and people along the way, often coming upon parts of the Lincoln Highway, which paralells much of the route. Check it out here: walkforrestwalk.blogspot.com/. When the U.S. government named two companies to build a transcontinental railroad in 1862. no meeting point was set. Enormous financial rewards—paid out per mile of completed track—propelled both sides into a grueling seven-year race across daunting terrain of the states of Nebraska, Wyoming, Utah, Nevada, & Califorina. When completed the railroad connected a post Civil War nation, forever changing the American West. For the next 6 months & 1500 miles Forrest will follow this important and historical route that our ancestors followed so many years ago. Check out the sign hanging from it! That looks to be the pine tree on the right, next to the white square, which is probably a sign. Surely the tree has been written about by Utah historians or by railroad fans. Can anyone tell us more about it?